Today, I am off to a slightly slower start than normal after an unexpectedly full night. It began at a delicious parrilla in Palermo with new friends Courtney N. and Mabel. We savored the sabores of thyme-covered lomo de bife and french fries with about 8 different sauces to choose from, and washed down the succulent red meat with a couple healthy glasses of velvet-red malbec. Dinner was followed by a quick jarra de Quilmes at a nearby bar, then a short taxi ride to a drumming club in Abasto where we met up with my cousin Hernan (a drummer/musician himself), and his friends. The next few hours became a happy blur of smoke, saxophones, trumpets, trombones, clarinets, a few unidentifiable instruments, drums, smiles, Spanish, and crazy haircuts (Argentines often rock haircuts such as: the mullet, the rat-tail, the dread-locks, the buzz-cut-with-pony-tail, the long-hair-with-random-chunk-shaved-off, or the curly of-European-descent ‘fro. My personal favorite is the one that mixes three or more of these styles together on one head — probably the most common!). It’s hard to describe what it’s like to listen to good drumming. It’s a feeling. For some reason, I LOVE IT. More than you’d assume. I feel so connected to drumming, like it’s creeping through the floor into my body when someone plays. All you can do is just let it move you; let it bounce around in your hips, try and catch it with your feet, let it thump around you, and enjoy. So that’s what we did, until the wee hours of last night. I love this shot 🙂 Am I allowed to say that? originally, when i saw the color of the wall behind them, i was going to say el caminito, but then upon further reflection, i honed it a bit further, as i know there is a lot of impromptu tango on the streets of san telmo. what do i know about it? well, for starters, there’s a lot of impromptu street tango. and i also know that in the mercado, it’s really just a lot of trinkets. worst of all? they charge you a few pesos to use the bathroom! It could also be in Recoleta, another touristy hot spot…. 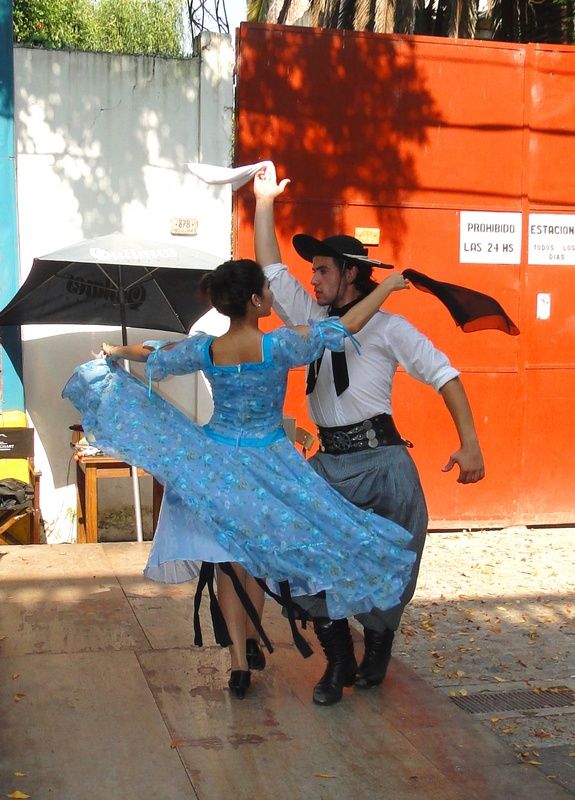 btw, these are the gaucho and his chinita dancing a zamba.